Please Ford, get it out of here. There is a certain legacy surrounding the Ford Taurus that makes it hard to send to the crusher. The first batch of Ford’s cars named after an astrological symbol was a huge success. They were aerodynamic (for the time) and sold very, very well. Hell, throughout the years the Taurus was extremely popular. The second generation model (1992-1995) was the best-selling car in American. From that point forward, things got ugly for the Taurus. That's right, we're talking about the jelly bean redesign. That 1996 redesign killed off the sales frenzy with overdone curvaceous styling and an abundance of the main enemy of good cars: weight. Ford kept its sales strong by dumping unwanted Taurus models into rental fleets, and eventually sales found stability. In the 2000s Ford was more concerned with making ever larger trucks and SUVs, so design dollars were thrown that direction with the Taurus seeing only marginal improvements. Meanwhile Honda and Toyota upped the ante in the mid-size segment and hit the jackpot when fuel prices skyrocketed. As the relevance of the Taurus eroded, Ford pulled the plug in 2007 just before the economic crash. Three years and a recession later, the Taurus reappeared ready to sell in the full-size segment. Unfortunately the Ford Fusion had already evolved and stepped in to steal sales by offering the same package with better execution and a lower base price. The idea behind capitalism is that consumer dollars are supposed to vote for which products get to stay on the market and which ones need to go. Ford hasn’t seemed to get it with the Taurus. The Lincoln MKS, a Ford Taurus with more leather, a styling language that only Mathew McConaughey can love, and a higher base price, is already headed to the chopping block. One would think that the brain trust at Ford would sentence the Taurus to the same fate. But this isn’t the case, and we think the Michigan-based company must be crazy for coming to this conclusion. After all, the Taurus is a big sedan, and that’s something Americans no longer like because crossovers are the vehicles that the market has gravitated to. Buyers looking for something smaller and just as practical in the Ford family will immediately flock to the Fusion. The Fusion have curvy styling and a grille straight from an Aston Martin to lord over the Taurus’ stout and outdated lines. It also weighs almost 500 pounds less and carries a $5,000 discount. A small, efficient engine does its duty well in the Fusion while the same engine is burdened by the extra weight in the Taurus. Sure, a 365-horsepower Taurus SHO is an option, but for the same $40,000 the Cadillac ATS is available with a 3.6-liter V6 making 335 horsepower. That 30-horsepower gap is made up for with the fact that the Cadillac is a luxury car, weighs nearly 400 pounds less, and rides on GM’s highly regarded Alpha platform. So why does Ford still make the Taurus? Aside from supplying police fleets the car is also weirdly popular in China. An ax to the Taurus here would mean missed sales opportunities in China, unless Ford decides to build its of not-for-America Taurus there. We’re fine with a company selling a bad car elsewhere if there is a market for it, but please, Ford, at least get it out of the US. No matter what Ford's reasons are, numbers don't lie. 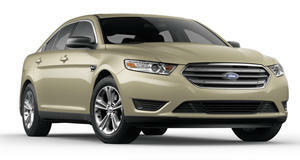 The Taurus sold 4,262 units in March compared to the Fusion's 29,675. Hopefully Ford wises up and puts the Taurus down once again.